Hellsing tells the story of an organization named the same as the show. Is an anime gender show that spins around an organization that focuses on protecting the queen of England form the undead and other supernatural forces. Its main force is the original and oldest vampire Alucard which was defeated 100 years before the story line by Abraham Van Hellsing and therefore swearing his services to him and later inherited into the current Hellsing organization leader Sir Integra. The anime also throws comic relief by introducing from the very beginning Seras Victoria, an ex-police girl that was transformed into a vampire by Alucard after receiving a fatal wound and preferring vampirism over death. The anime is based on a manga of the same title written and illustrated by Kouta Hirano and produced into a television series by Gonzo. Even so the anime was based on the manga they do not share the same plot and story line. The series totals 13 episodes, 1 traditional season, and was first shown in October 1, 2001 and the last episode showing on January 16, 2002. Even so no second season for this series has being announced the first season is sure to leave the viewer desiring more. The television series has a lot of gore incorporated into it and therefore it might not be appropriate for a younger audience. It has a compelling story that transition smoothly from one episode to the next with decent amounts of comic reliefs without ruining the horror and action genera of the series. To add more to the story line the cast did a great job adding two other organizations, on being the Vatican that has the goal of getting rid of all undead in the world including Alucard and Millennium a Nazi organization creating a vampire army and like this causing a three sided war that will leave the action enthusiast in states of awe and with desires for more. After the Queen cancels her ceremony at the Hellsing HQ, Integra hears word that her soldiers are having trouble fighting at the Tower of London, including Seras. Shortly after, the British military labels the Hellsing Organization as a terrorist group and attempts to halt their operations. Alucard heads out to the Tower of London to help the Hellsing units and meet Incognito, face to face. In a desperate attempt to prevent herself from becoming a Ghoul, Integra cuts her throat open. Several doctors then attempt a very delicate operation to save her life. Seras sadly watches the operation from the side, while Alucard shows his first true emotions and feelings toward Integra. Several flashbacks occur that show how Integra met and released Alucard, and the events leading to her becoming the leader of the Hellsing Organization. The Hellsing Organization is the middle of a castle raid when, suddenly, they are told to pullout of the keep and let a group of S.A.S member's handle it. Seras senses that something there's more to the castle, but doesn't have time to found it. Back at the Hellsing HQ, Integra's sister, Laura, unexpectedly arrives. Things get even more confusing as a powerful new enemy emerges . . .
A Chinese factory is destroyed along with the evidence inside, so Integra deploys several units to find any information about the computer chips that are making fake Vampires. Seras finds herself back at her old apartment where memories of a forgotten family flood her. After wards, Seras meets Helena; a old and wise Vampire who is child-like in appearance. The assault on the Hellsing Organization's HQ continues, with Jan leading the Ghoul Army towards the Round Table's meeting-room where Sir Integra is. Right outside, Walter and Seras plan to put a halt to Jan's plan. Meanwhile, Luke heads down to the barracks where Alucard waits patiently for him. The Valentine Brothers, a couple of Vampires have decided to fight back against Hellsing and start a surprise attack on Hellsing HQ. At the same time Sir Integra is called to the Knights of the Round Table about how to deal with the raising man-made vampire problem. The Internet becomes flooded with video footage of live executions. The media begins to air them, because it's what the people want to see. The Hellsing Organization decides to investigate the site of the killings. 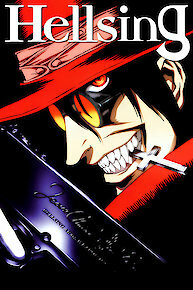 Alucard is eventually sent in to to deal with the Ghoul responsible for the killings. A young man dies in the arms of his lover, who also happens to be a man-made Vampire. He comes back to life looking for his companion, but is quickly put down by the Hellsing Organization. The Iscariot Organization sends one of its priests, Paladin Alexander Anderson, to deal with the Vampire but after arriving too late begins to fight Alucard, sparking a rivalry between the two. The Hellsing Organziation is called in the small town of Cheddar, where the dead are coming back to life. A small group of police officers, one being a young women by the name of Seras Victoria, finds her way to a secluded church where the source of evil is emanating from. Alucard, a powerful Vampire, follows in the shadows. Ten years ago, young Integra Hellsing ascends to the head of the Hellsing Organization after the death of her father Arthur. Her jealous uncle Richard Hellsing attempts to kill her, but in doing so awakens a dormant Alucard, who proceeds to kill Richard's men. It is Integra who shoots and kills her uncle, thereby becoming the last descendant of the Hellsing bloodline. Alucard declares his allegiance to Integra and becomes her loyal servant. In present day England, Alucard is called to duty to eradicate a vampire priest and his ghouls. However, a police girl named Seras Victoria is gravely injured in the process, and upon giving her a choice to live or die, Alucard turns her into his vampire servant. Later, on a mission to hunt down a vampire in the town of Badrick in Northern Ireland, Alucard meets and fights Father Alexander Anderson for the first time. Hellsing is currently available to watch free on Crunchyroll and stream on Encore Action. You can also stream, download, buy, rent Hellsing on demand at Amazon, Hulu, Vudu, iTunes online.